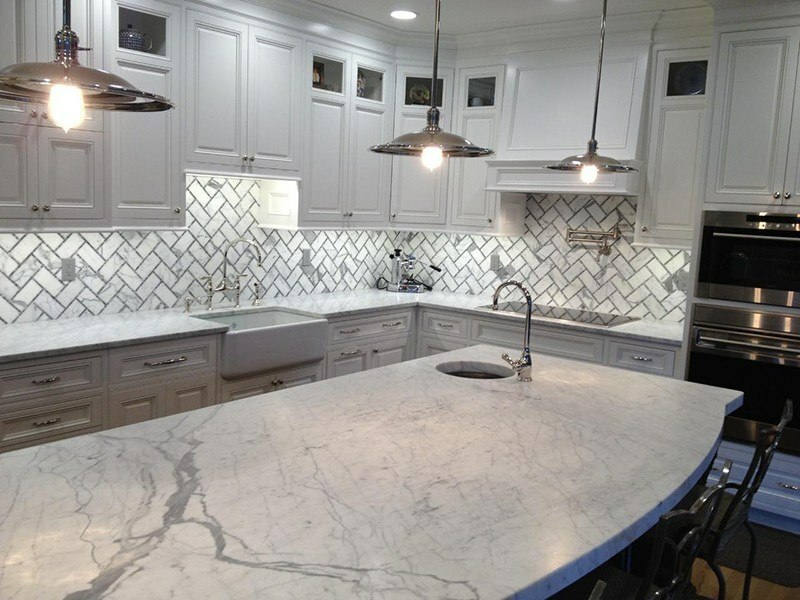 There are so many good tile choices out there that it can be hard for a homeowner or business owner to make a decision on whether to buy porcelain or marble tiles. While the two materials can even look like each other at times (especially when porcelain is made to mimic marble on purpose), they are two completely different materials. Before you choose one over the other, it's important to know the pros and cons of each so you can make an informed decision. Here are some things to consider before you start your next project. Typically, pros and cons are evaluated on exact criteria, like cost or durability. However, with such a wide range of marbles and porcelain tiles, the criteria can end up being pretty even depending on the exact choice. For instance, Carrara marble is less expensive than Calacatta or Statuario, and it's typically easier to install than some porcelains. Thus, although porcelain tends to be a less expensive material to buy, when you add the cost to install (which needs a special grout) the total cost can end up being on par with some marbles. The range for porcelain tile, for both material and installation, can range from $8 to $15 dollars per square foot. In comparison, marble cost and installation can range from $9 to $24. Thus, in terms of pros, porcelain is a less expensive material than marble, but that's only true when you don't consider the choice of marble and the installation costs. 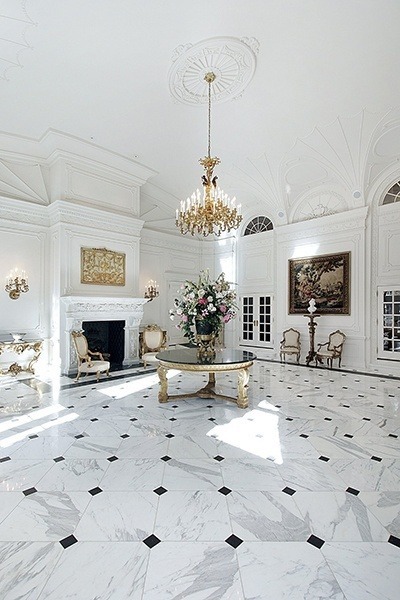 Marble is a luxury material, but it also is heavier and of higher quality than porcelain. Both marble and porcelain are hard materials, but porcelain is rated on a PEI scale. Those tiles with a PEI (Porcelain Enamel Institute) hardness rating of 4 or 5 are good for home and business traffic. A PEI rating of 3 is good for residential and only light commercial traffic. Anything below is suitable only for residential foot traffic, with a PEI rating of 1 being for light footwear like slippers or socks. A PEI rating of 0 means the porcelain tile is only suitable for floors, since it's not that durable. Depending on what tile you choose, the durability will be determined by the PEI rating. Marble, on the other hand is suitable for all types of foot traffic, no matter what type of marble you choose. It is rated on the Mohs hardness scale and comes in at between 3 and 5. 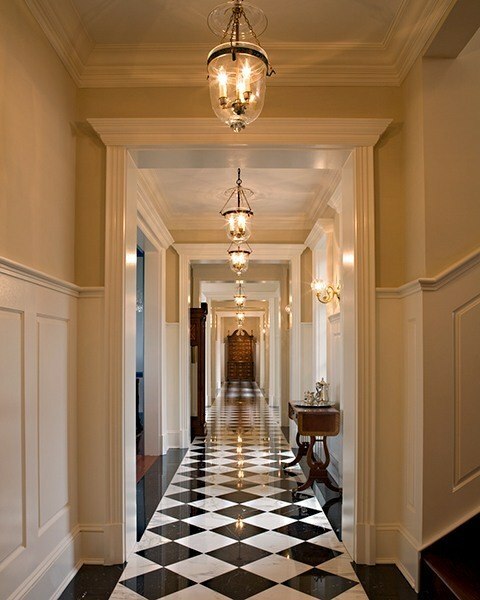 It is unlikely to wear down under normal wear, which makes it perfect for a hallway that gets lots of foot traffic. Porcelain is a very hard material that is often glazed. The fact that is a dense material with a glaze makes it water resistant, stain resistant, and less likely to fade than marble. 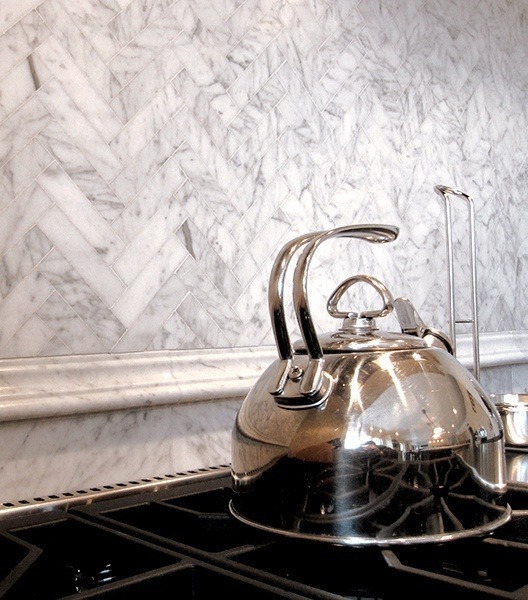 Marble, on the other hand, is more porous and can soak up stains or even become etched with acidic liquids. That's why marble has to be sealed regularly against such accidents, particularly if you put it in the kitchen. In terms of maintenance, though, again it depends on the porcelain tile you choose. If you pick a highly textured porcelain tile, like this one, it can become chipped or be difficult to clean. Once chipped, porcelain tile is actually harder to fix than marble that is damaged because you have to replace the entire tile, instead of just spot-treating the damage. Hopefully, you have extra tiles because sometimes porcelain tiles can be hard to match years later, once they do get cracked. Here is a video of how to replace a porcelain tile. Porcelain tiles are harder to install than ceramic because they need a special grout. They are also heavier than ceramic tiles meaning that they may need a substrate to support the weight. Marble is also a very heavy floor material and will need to be laid out before the actual installation to get a visually appealing vein pattern throughout the whole design, like in this floor. So, although you don't need to match or lay out porcelain tiles, it comes with its own difficulty of installation too. Marble has always been associated with timeless beauty, but there is no reason you can't love a porcelain pattern as well. It's really up to you what you find more pleasing. However, marble has a wide appeal to so many people that it even increases the resale value of your home, unlike porcelain tiles. They have no effect on the resale value of the home. Porcelain is also hard on the feet and very cold to stand on, so that some people prefer the softer feel of marble floors. So, despite the fact that they both are beautiful materials, one is more marketable and profitable to install in the home than the other, when it comes to selling your home. 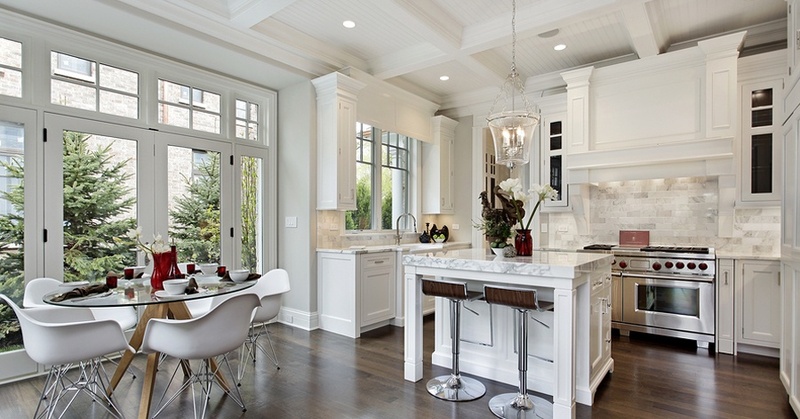 Honestly, wouldn't you want to buy a house more if you saw this luscious kitchen all done in marble? 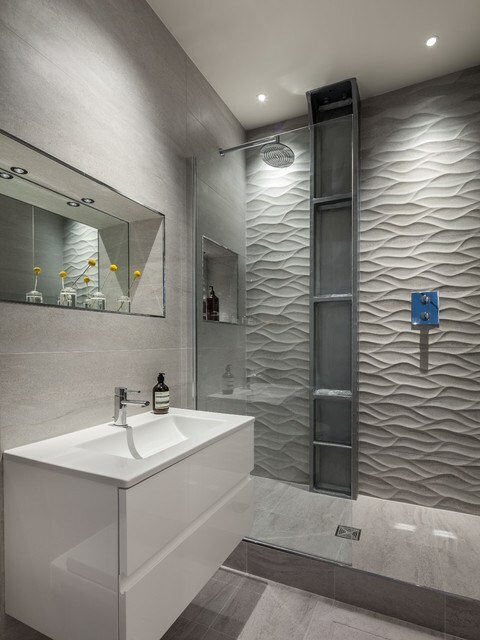 It's true that some builders advise using porcelain in areas that are wet, but if marble is sealed and properly maintained there is no reason it can't be used in areas of high moisture. Porcelain, while being water resistant, is much more slippery than marble, so that also has to be taken into account. 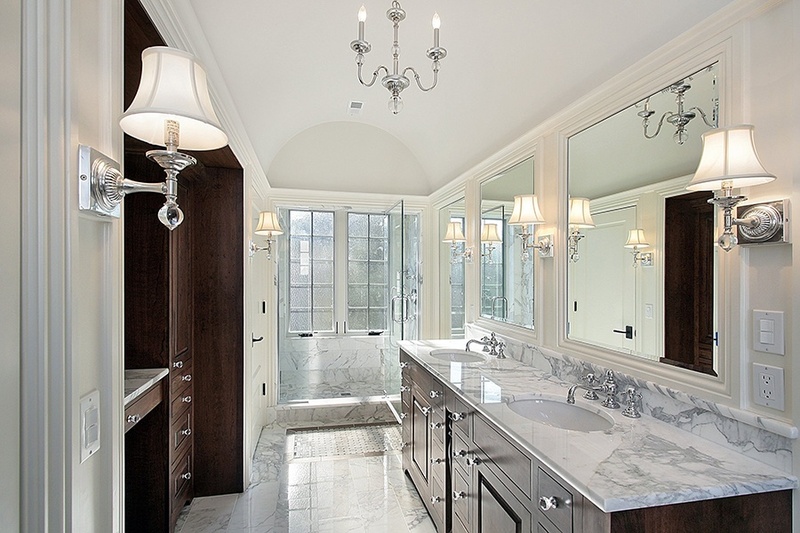 If you are looking for universal appeal, choosing marble is a wise choice. However, porcelain can also provide a way to make a design uniquely yours, but it won't increase the sale value of your home. If you want a porcelain tile for flooring, you have to stick with tiles with a PEI rating above 3. All marbles are suitable for flooring. Get a quality installer in either case as both marble and porcelain have exact installation requirements that can make or break a project. In terms of cost, you can choose a less expensive marble and match that of some porcelain projects or go all out and go on the high end to get a really luxurious look. If you have more questions about the pros and cons of using marble versus porcelain, please feel free to comment below.